The J2M5 Raiden is a Rank IV Japanese fighter with a battle rating of 5.7 (AB/RB/SB). It was introduced in Update 1.51 "Cold Steel". 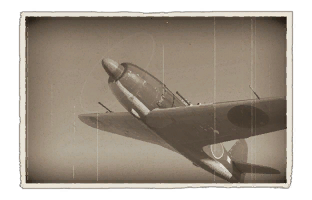 Unlike its other Naval brethren in the Japanese tech tree, the Raiden possesses a top speed rivalling that of the P-51 D-5 Mustang. 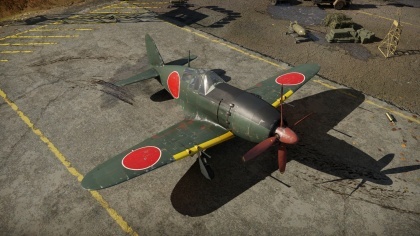 Although a stubby and small aircraft, the Mitsubishi J2M Raiden can be considered one of the best Japanese fighters in War Thunder. Wielding four 20 mm cannons, this aircraft is more than capable of dealing with heavy damage. However, the main advantage the Raiden has over its Allied counterparts is its climb rate. In Realistic Battles, the J2M5 can climb to higher altitudes very quickly, especially when given an air start. This facet of the Raiden's performance is particularly exemplified in the J2M5, the last in-game variant of the Raiden that features the greatest performance of the series. This is partially due to its mechanically-driven supercharger which allows the J2M5 to perform at altitudes once thought impossible by Japanese engineers. Once at a high altitude, it becomes possible to choose when, where, and who the J2M5 want to fight. The J2M5's 20 mm cannons may initially seem rather lacklustre but they have a knack for snapshots or quick bursts of fire that result in a victory while manoeuvring. Generally, the J2M5 performs similarly to the early Fw 190 A variants, having a deadly armament, good roll rate, low top speed, but higher climb rate. The J2M5 differs from this rule slightly as it was built for speed and high-altitude performance. The Raiden is best used as an energy fighter - instead of "turning and burning", or losing all built up speed in turns, attack enemies from a higher altitude and then regain that altitude once the attack has been delivered. The J2M5 excels at Boom & Zoom due to its high rate of climb, deadly armament, and high altitude characteristics. Sharing this role with other "energy fighters" such as the Fw 190 D-13 the Raiden's main downside is its lack of manoeuvrability. Similar to its earlier mentioned German counterpart, the Raiden struggles to beat enemies in turn fights, especially Spitfires. If caught in a sticky situation, the Raiden pilot may choose to dive away or seek help from teammates. Trying to fight an enemy Spitfire in a turn battle with any J2M is a terrible idea unless the enemy aircraft is damaged or many teammates are nearby. Moreover, the J2M's high-speed manoeuvrability is very poor; often, it becomes a gamble when pulling out of a high-speed dive as the Raiden's elevator authority at high speeds is lacking. The entire aircraft locks up at excess speeds of 645 KPH/400 MPH. It can be very difficult to pull out of a dive, roll, or turn when at high speeds with the J2M. The Raiden's manoeuvrability is more or less on par with its enemies in simulator battles, for the most part. The Raiden pilot may also find themselves outclassed at extreme altitudes by aircraft such as the Ta 152. All these aircraft have to do to avoid the J2M5 is dive away and build up speed. Fortunately, this aircraft has a surprise - a massive ammunition pool totalling 800 rounds. With good aim and practice, it is possible to "snipe" enemies from upwards of a kilometre away. Overall, the Raiden is best used as a surprise attack, high altitude, high damage output fighter. Where it lacks in the manoeuvrability category, it makes up for in armament and rate of climb. The J2M5 also has improved cockpit visibility over the M2 and M3 variants. The J2M5 wields two 20 mm Type 99 Mk. 1 cannon and two 20 mm Type 99 Mk. 2 cannons in the wings. The stock belts are particularly lacklustre for both of these weapons but since there is such a large amount of ammunition carried in both the effect is virtually negated. The "Stealth" belt has the best combination of AP/API and HEF to shred enemy aircraft, and are recommended for those who do not need a tracer shell to aim. Alternatively, for those not used to IJN 20mms, the "Universal" belt is the best bet. The "Tracer" belt is filled with HEFt shells, but they only contain half of the power of a standard HEF and can give away the plane's position. For ground attack, the J2M5 can equip two 60 kg bombs under the wings. While not the biggest, these bombs can help a team win a match, especially in arcade battles. The J2M5 can also wield armor piercing ground targets ammunition for its 20 mm cannons, although 21 mm of penetration is nothing to boast about and should be ignored, unless targeting armoured personal carriers (APC) or similar armoured cars. Unlocking all performance modules should be a Raiden pilot's first concern, as the default belts for all weapons are workable. After that, go for the weapon belts, as these make more targets possible (ground units). The J2M Raiden was the result of the Japanese Navy request for an interceptor, the need of which became ever apparent after the experiences with the American raid on the Japanese homeland shortly after the attack on Pearl Harbor (Doolittle's Raids). The Chief Designer was Jiro Horikoshi, who also designed the famous A6M fighter. However, unlike the A6M, the J2M was geared for a completely different role, focusing more on the rate of climb and speed, then range and manoeuvrability. The Raiden had only a limited range and was solely used as an interceptor. The most important feat of arms came with the American B-29 raids over Japan, where the J2M Raiden proved to be a real threat to the bombers - the J2M was well armed, fast and the large pools of ammo meant that despite a small number of Raidens, the four squadrons operating them were credited with the destruction of 21 Superfortresses during the later months of August 1944 to the end of the war. Furthermore, the J2M2 saw limited action in the Philippines, although it was largely ineffective. This page was last edited on 19 March 2019, at 15:01.